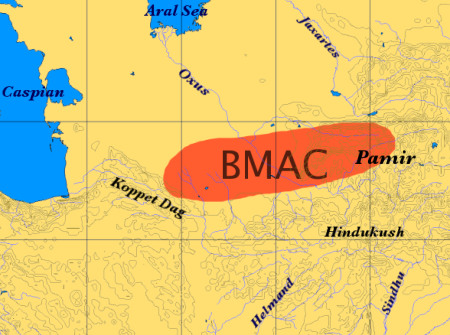 The Indo-Aryan contribution into Mesopotamia came directly from southern Central Asia. Even in Sumerian times the Oxus River kingdom of Margash/Marhashi (Margiana) extended it's grip into Elam. 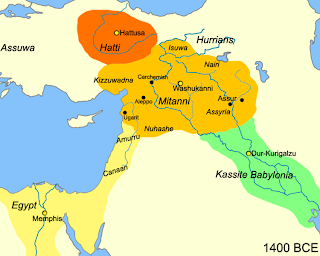 The Mitanni was a confederacy of eastward moving Hurrians, and remnants of westward moving Indo-Aryans. After their destruction a part of this confederacy was the kingdom of Manna. The Caucasus was a void of Indo-Iranian influence until the entry of the Persians into the region. The "Dagestani" component is likely to predate any cultural assimilation of Indo-Iranian culture and language, before they moved deeper into India. A Dagestani component could be a Harappan substate, absorbed prior to Indo-Aryan expansion into India. If it were a generalized Indo-European component, we would find it in Anatolia and Europe in greater frequencies. And, since the Mittani were on the fringe, rather than at the core of Indo-Iranian language expansion, and appear latter in time than hypothetical Indo-Aryan arrival in India by about four hundred years at least, so that seems an unlikely source in India. Isn't the Caucasus known for moderate frequencies of Y-DNA Haplogroups R2 and L(xL1)??? Isn't the Caucasus region also where it is speculated that Y-DNA Haplogroup R1a originated??? And, of course, the Sub-Continental populations are full of those particular haplogroups. Would that have anything to do with it as well??? I don't know...but what you said is curious...unless you are reading it wrongly, which I doubt you are. Just as an aside...I read an interesting paper that said that according to the names found in records associated with the Oxus Civilization (well, really it was substrate words in Western Indo-Iranian languages)...Their language was an eastern variant of Hurrian. Anyone interested in the paper I can send you a copy. By the way, it is in French. You are a little indirect in what it is you are proposing as your theory here. If your theory is that the "Dagestan" component is a sign of the original Indo Aryan (and possibly Indo European) movements of language then that sounds reasonable. But your theory also seems to be that you are hoping that this "Dagestan" component is evidence that Indo Aryan was Middle Eastern, (your favoured theory), rather than originating on the north side of the Black Sea-Caucasus mountains-Caspian line (which would be the more orthodox theory)? 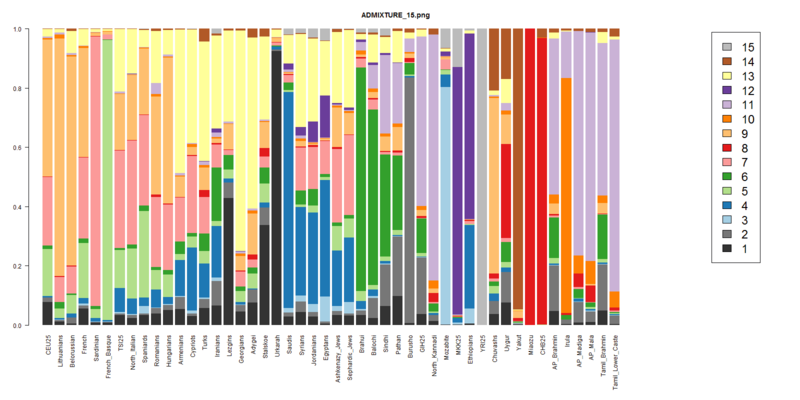 Just another observation...Could that be an indicator of Y-DNA Haplogroup J2 or some type of pre-historic "Mediterranean" admixture...As I see it in the Tuscans and Anatolians/ Turks, the Romanians and Hungarians (Hungary has a more moderate frequency than Romania, but still present at about 8% in a metasample), and all throughout the Caucasus populations in which J2 is frequently found. Interestingly, the Anatolians/ Turks and the Tuscans have almost the same amount and would seem to confirm (perhaps) a Near Eastern (more Anatolian) origin for the Etruscans??? These are areas where Y-DNA Haplogroup J2 is widespread. In one study as much as 19% in Tuscans and nearly the same frequency is found in the Sub-Continental region. If you look at the chart you posted, Dienekes. All the populations correspond ALMOST perfectly to the distribution of Y-DNA Haplogroup J2 in those populations. Perchance, it is just an uncanny coincidence. Yes, the other piece of the puzzle that I forgot to mention is the presence of haplogroup J2a in upper caste Hindus. Whether there is correspondence with any autosomal components, I can't say, but this too links them with eastern Anatolia. What you call the "orthodox theory" does not account for the high presence of Y-haplogroup J2a specifically among upper caste Hindus. It is also less parsimonious than my theory as it posits twin migrations from the steppes to get the Mitanni AND the Indo-Aryans where they are found; my theory requires only a single migration west to east. Also, I did include Balto-Slavs in both this and the European version of the Daghestan admixture experiment, and they do not seem to be particularly high in that component, so I can't treat it as some kind of steppe or eastern European element. I would attribute the pre-Indo-Aryan component in South Asia to the "Pakistan"/"India" components (#9/#1 in this figure), especially the latter. I would expect the dense agricultural populations of a large territory to have a bigger demographic impact than the exogenous elements, and these 2 components are the natural candidates as they are both local-looking and numerous. On second look, it seems that a specific "Harappan" component might be related to the Burushaski (pink #5) component. May you send me, please, a copy of that paper. According to Witzel, Mitanni is more archaic than Vedic Sanskrit. What you call the "orthodox theory" does not account for the high presence of Y-haplogroup J2a specifically among upper caste Hindus. I would think your aim, however, is to say that there is strong autosomal evidence, and not rely on just this one Y haplogroup. It is also less parsimonious than my theory as it posits twin migrations from the steppes to get the Mitanni AND the Indo-Aryans where they are found; my theory requires only a single migration west to east. The Mitanni do not appear to have been local to the Middle East though. What's more the parsimony disappears when you consider that Indo Aryan in the form of Iranian languages also appear at least as native to Europe as the Mitanni appear to be in the Middle East. Also, I did include Balto-Slavs in both this and the European version of the Daghestan admixture experiment, and they do not seem to be particularly high in that component, so I can't treat it as some kind of steppe or eastern European element. You mean the evidence does not support it, which is indeed interesting, and I am not saying you do not have a great bit of work on your hands here. Congratulations. However, coming back to the most stretched form of what you are thinking of, what about the Middle East? Do you see the "Dagestani" component there any more than in southern Russia? I think that with this type of evidence it is worth considering not only linguistic links but also earlier possible material culture links which might not show up in terms of known languages today. For example, if whatever we are seeing is Middle Eastern could it be a sign of early farming technology? I know this gets proposed for just about every new bit of data, but perhaps well worth considering here? It's another piece of evidence on top of the autosomal evidence. The "Middle East" is a big place, the fact that they were not local in Syria does not mean that they did not originate somewhere in West Asia. First of all there is no Indo-Aryan in the form of Iranian languages, as Iranian languages are not Indo-Aryan. I don't know where you are getting the idea of Iranians being native to Europe. Sure, many Iranian groups found themselves on the eastern European plain, but the sources are pretty unambiguous from the Scythians to the Alans that Iranians came to Europe from the east, they were not native to it. A lot of early historical and archaeological research into the origins of Indo-Aryans focused exclusively on the horse and chariot, evidence of which has been found in the Andronovo culture north of the Caspian and BMAC. Does a transcaucasus origin of the Indo-Aryans fit with this? The origins of the Indo-Aryans don't say anything about the origins of the early Indo-European steppe tribes. However, if anyone here is suggesting that the Andronovo groups originated in the Middle East, or even near Dagestan, and that they carried anything more than at best small amounts of J2, then that must be some kind of a joke. If that's the case then I'm a spider monkey. Dienekes : I don't know where you are getting the idea of Iranians being native to Europe. I think he was referring to the tracks of what seems to be proto-indo-iranian (or very early Indo-iranian) in Finno-Ugric languages * (including the Finnic ones, in Europe), That's why the Abashevo culture and Andronovo horizon are generally suspected to be early Indo-iranian (there are of course many other reasons). Interestingly, Elena Kuz'mina says the description of the Mitanni garments and their association with the horse and chariot makes them likely from the bronze age Steppes **). Horses existed in Anatolia since the Neolithic, and chariots are depicted in Sumerian artefacts from the 3rd millennium BC. So, I see no reason why that would be a problem. The probable fact that the horse was domesticated in the Eurasiatic steppe has no bearing on the question of its importance in Indo-Aryan culture. The horse/chariot combination came to be very important in all ancient Near Eastern cultures, so I don't see why it wouldn't be important for the Indo-Aryans. It's like saying that "the car is important in American culture, therefore Americans must be the same people that invented it". When one looks at the Y-DNA of the Brahmins in India , he will easily sees that the only 2 hg's that are common to both Aryan upper cast Brahmins(as descendants of the Indo-Iranians)as well as the earliest Indo-European civilisations(I.E civilisations of Greece,Cretes,Anatolia,Italy...)are J2+R1a however R1a is assigned a local Indian origin this will leave us with only 1 "Indo-European hg marker"=>J2. The earliest chariots have been found on the steppe, at Sintashta. Later chariots appear in the Near East, associated with the Indo-Aryan speaking Mitanni. All that can be easily explained by the history of this region. Dagestan was a part of the Timurids state than included Central Asia, Iran, Afghanistan, parts of Pakistan, Mesopotamia, Anatolia and the Caucasus. In the 16th century Timurids invaded India and founded the Mughal Empire. "The horse/chariot combination came to be very important in all ancient Near Eastern cultures..."
Well, in her book, Kuz'mina gives a few reasons why chariot was probably imported by Indo-iranians from the steppes during bronze age in west Asia (but I'm too lazy to rewrite it here, sorry :) ). "...so I don't see why it wouldn't be important for the Indo-Aryans." I don't know where you are getting the idea of Iranians being native to Europe. Actually I did not say they were. I was taking the position that they might be from either the north or south of the line of seas and mountains I mentioned. Sure, many Iranian groups found themselves on the eastern European plain, but the sources are pretty unambiguous from the Scythians to the Alans that Iranians came to Europe from the east, they were not native to it. Want to name those sources? If another blogger wrote that "the sources" say the same thing for the Middle East would he/she be less right? Are you saying that you think the above is a fair statement of the real case you are citing? Not only does horse domestication originate there, but also the international word for the wheel appears to be Indo European. @ Dienekes : "Ok, so Anatolians lived in close proximity to Indo-Iranians, yet another argument in favor of my theory of Transcaucasian Indo-Aryan origins..."
But somehow they don't seem to have left too much vocabulary beside "horse". May you send me, please, a copy of that paper." Sure, Ashraf, I can send you the paper. You can send me an e-mail and I will send it to you. "I would think your aim, however, is to say that there is strong autosomal evidence, and not rely on just this one Y haplogroup." Like Dienekes said and to elaborate...Y-DNA Haplogroup J2 is the Y-chromosomal link to all the populations in his analysis. All the populations that feature this Caucasus component have high to moderate frequencies of Y-haplogroup J2 in common. At first, I thought it would be others, but after looking more closely...it came to me as J2, not R2 or L(xL1) as I originally posted...Perhaps, R1a has something to do with it as well? The Y-chromosomal link is gravy or icing on the cake if you will. I think the SEEMING correspondence of certain Y-chromosome signatures or even Mitochondrial signatures with certain autosomal signatures bears investigating. For instance, the light-blue seems to correspond with populations high in Y-haplogroup R1a, but that would not explain it's NEAR non-existence in the Slavic and Baltic populations. Perhaps, the light-blue component represents and older R1a population as compared to the relatively "young" "R1a" component (the orange component) in Europeans, also different founding populations? Perhaps, correlating to R1a-M458??? I, also, think the size of the sample and where it was taken should also be factored in. I don't know...I am just musing. Also, the light-green component seems to correspond with populations with a high degree of Y-haplogroup O. "The fact that many languages of ancient Asia minor seem to have borrowed the word from the Indo-iranians (from "asva") rather supports the "Indo-iranian" theory IMO : Hittite ("centum") "azu-wa", Ugaritic "ssw", Lycian "esbe", etc..."
I thought that the Anatolian IE languages were older than the Indo-Iranian branch and developed separately from Indo-Iranian as many of the innovations found in many ancient IE languages are lacking in the Anatolian languages. And the Semitic languages have independent terminology and etymologies for the word you listed...Which would SEEM to correspond to the proposed etymologies for the word, Asia. "What's more the parsimony disappears when you consider that Indo Aryan in the form of Iranian languages also appear at least as native to Europe as the Mitanni appear to be in the Middle East." That's wrong, first because the statement "Indo-Aryan in the form of Iranian languages" is nonsensical, as Iranian languages are not Indo-Aryan. Second, if what you meant was that someone could claim that Iranian languages are as native to Europe as Mitanni are in the Near East, I would like to see your evidence for your statement. The Mitanni are actually ONLY native in the Near East. There are no Mitanni anywhere else to be found! And, the Indo-Aryan element in Mitanni only has parallels in South Asia. Iranians are first attested in Europe much later (the Scythians), in the 1st millennium BC, there are literary sources (Herodotus) that derive them from Asia, and all their known linguistic relations live in Asia (all other Iranian speakers, and the more distantly related Indo-Aryans). Hence, to claim that the cases for "Mitanni native to the Near East" and "Iranians native to Europe" are somehow equivalent overlooks the evidence. Interesting. What about the major Caucasian-Daghestani Y DNA J1? We can find some rare J1's(not the Semitic P58+) always associated with some types of J2 in Pakistan, in India and in Northwest China - identify significant contribution from Central Asian pastoralists. And of course the rare Y DNA J1b came from that region (Caucasus-Georgia-Northern Iran-Eastern Anatolia), probably associated with the Alans in Western Europe, so the mythical or imaginary PIE gene pool could be found in that region or at least some of the Ancient Iranian Y DNA J1 pool (L136 negative and P58 negative) could be recovered just like some rare J2's and other haplogroups-haplotypes from that region as possible elements of a single source for the old original PIE or old Caucasian-Daghestani autosomal Indo-Iranian, or Indo-European gene pool. What about the major Caucasian-Daghestani Y DNA J1? There are three answers for this. 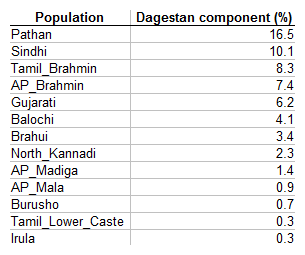 First, Dagestan is a proxy for a particular type of ancestry; we can't assume that it's always associated with the Y-component that happens to be modal in Dagestan. Second, assuming that the early Indo-Aryans had a patrilineally transmitted group identity and they mixed with a J1-bearing population, their autosomal DNA would be affected, but their Y-DNA gene pool would not. That's a reasonable assumption, given that even today caste identity in India is often patrilineally transmitted. Third, a particular Y-haplogroup is not always associated with the same autosomal DNA, and for example J1 is associated with quite different gene pools today (Saudi vs Lezgin). "Note that chariots are light vehicles with spoked wheels. They usually have two wheels. Such vehicles are not depicted in Sumerian artefacts"
I dont see why people that made 4 wheeled chariots could not make 2 wheeled chariots(that's called argument by the silence)both are chariots and are used to transport people and goods, and surely 4 wheeled chariots are more solid and able to pass through the Caucasus mountain barriers (contrary to 2 wheeled chariots)! "The Sumerians had also a lighter, two-wheeled type of cart, pulled by four asses, but still with solid wheels. The spoked wheel did not appear in Mesopotamia until the mid-2000s BC." Those loanwords - if their direction is even clear - are not specific to Indo-Iranian, though - they appear throughout Indoeuropean languages (Proto-Indo-European septm; Indo-European agro, lat. ager, Germanic/German Acker). As to the Dagestan component, I am also wondering if the timing of its original dispersal perhaps goes back earlier - to the beginning of agriculture in the Caucasus. - the "Dagestan" component spreading roughly in equal or even higher proportion to Northeast Europe via north of the Black Sea. Note that the "Anatolian" component also entered Pakistan and India - just at a slightly lower rate, as expected due to the larger distance. "there is no Indo-Aryan in the form of Iranian languages, as Iranian languages are not Indo-Aryan." Aryan languages as a subset of a larger Indo-Iranian language family, and that seems to be the meaning of the comments to that effect. Like so many terms in this field, the terminology isn't entirely standardized. The exceptional thing about Mittani, of course, is that is shows affinity in particular to the Indo-Aryan languages of South Asia, rather than to either the Indo-European Anatolian languages or the Indo-European Iranian languages (which may see as descended from Indo-Aryan languages due to proximity and timing). "the word sabatum (7) is motivated within semitic...On the contrary, in pIE the word septm is not motivated and its elements -t- and -m cannot be explained.This fact proves that the word is a Semitic loanword in IE.An alternative hypothesis regarding the IE and pSem terms genetic cognates would be untenable: -at- as a masculine marker for numerals is a Semitic innovation"
Note that this same number 7 was also borrowed(probably via IE for Uralic,Turkic and Etruscan)to proto Kartvelian "swid",Uralic "sat" and proto Turkic "setti" as well to Etruscan "semp" and Hurrian "sindi"
The Proto-Turkic form for "seven" begins with */j/ ("y"), not */s/. Yakut has changed Proto-Turkic */j/ > /s/, and some other Turkic dialects (e.g. Kazakh) have changed */j/ > /dZ/ (like English "j"). Since the linguist-inclined are in the house, can anyone tell me where the Turkish word "hafta" = week comes from? It seems related to the Indo-European word for seven, and even to the Greek one (hepta), with Greek known for the initial s to h transition. I had not heard of the relationship between sabatum and the numeral for 7 before, but it also makes sense. The 7-day week seems to have Semitic origins, doesn't it? "About septm, the phonetics of that word is not IE .."
Ashraf, you tried to specifically use this as an Indo-Iranian example. Thing is, this word --- as many others, are pan-IE, with no documented eastern preference. Thus, they are meaningless in the context you tried to evoke. That's all. In Sanskrit you can pronounce both Sabat and Sapt, and if the direction was from Semitic to Sanskrit, the former would be the form in Sanskrit. On the other hand, Sapt would be Sabat in Semitic, indicating to me that the direction of borrowing is the other way around. Absolutely, but it is very uncertain material to work with. I do not think it does. I think you are talking about lack of evidence, and lack of evidence is not the same as evidence when it comes to creating an argument about what is likely. The argument you are making is apparently entirely based on the fact that in the small window of written history we have for this very early period in the Middle East we see a few individuals who seemed to know a few Indo Aryan words related to horse training. Fact is that we have no such window on Europe or pretty much any other area. So there is no evidence for other areas, only lack of evidence. We can not make this parallel. You mentioned some sort of evidence ("sources") that Iranian did not have a European origin. I do not argue that it did have a European or Middle Eastern origin, but I am still wondering what evidence you are referring to. A recent paper based on YHGs proposes a similar theory of IA dispersal. My main contention is the excessive reliance of philological evidence that is always skewed to IE. The pre-existing groups in the areas pertaining to Aryan migration theories are greatly ignored or unknown to us. This is why I take any revelation based on the same type of evidence we had for decades with a grain of salt. There is evidence for names of Indo-Aryan gods; why do you limit it to words related to "horse training"? Also, the important thing is not the extent of the Indo-Aryanity of the Mitanni, but they serve as an anchor point; theories about Indo-Aryan origins and dispersals must also account for them. I already told you: the first clear (?) Iranians in Europe are the Scythians, and they were reported by Herodotus to have arrived in Europe from Asia by crossing the Araxes. Of course you may doubt Herodotus' testimony, even though he was speaking about events only a few centuries prior to his own age, but at least that's a source clearing deriving Iranians from Asia, whereas there are no sources deriving the Mitanni from Europe. Ergo, the evidence is not the same in the two cases. "There is evidence for names of Indo-Aryan gods; why do you limit it to words related to "horse training"?" And their peacock seals, representing a bird of south Asian not Iranian provenance. Dienekes, where did Herodotus mention that Scythians were Iranians? He never mentioned anything about any similarity between Persian and Scythian languages. Legends about Scythian eastern origin do not tell us anything about their language. What is your evidence for Iranian Scythians, and when and how they became Iranians? Did they come from Iran? 1. Concerning the god names, I believe they were invoked during horse training and are not otherwise known there. But frankly I'd need to double check. My more general point anyway is that we may be dealing with a few individuals. 2. Concerning Herodotus, didn't he also say there were several stories about the Scythians and indeed in the story you cite didn't he say the Scythians displaced ANOTHER Iranian speaking people in Europe (the Cimmerians)? Let me make it clear that I am not arguing against your argument as such, but only questioning the strength of evidence we have. I find the genetic evidence you are pulling together very interesting and potentially it could really make a difference on this question. I'm interested in the hydronyms in the Steppes North of the Caucasus/Dagestan, and many are of Iranic (Sarmatian and Scythian) origin. The name Dniester derives from Sarmatian *Dānu nazdya "the close river." (By contrast, the Dnieper River derives from the same Sarmatian Iranic, "the river on the far side.") The older name, Tyras, is from Scythian *tūra, meaning "rapid." It's interesting that the Celts worshiped a Goddess called Dana/Danu, and the ancient Celts generally viewed the earth as female and worshiped springs and rivers as being the sources of life, emanating from the female earth body. The only river in this area that is not a cognate of "Dānu", is the river "Bug". Interestingly in Polish the word "Bug"=God. They go on to equate the Indo-iranians with the "Timber Grave Culture" and their substrate with the "Abashevo Culture", with some links to the "Catacomb Culture"
Herodotus had no concept of an Iranian language family. The inference that they were Iranians comes from linguists. Also, by Iranian I don't mean inhabitants of Iran, but the linguistic category. There is scant evidence that the Scythians themselves were Iranians; for the Cimmerians there is zero evidence that they were Iranians. "not a single biological fact (at least insofar as craniometry is concerned) suggests that the only, or at least the principal ancestors of the steppe Scythians were people of the Timber-grave culture"
Pconroy, I am interested in scientific peer reviewed papers on Scythian or Sarmatian languages not in pseudoscientific etymologies and speculations. Those languages are not known. There is no agreement in regard to hydronims. Each can have 10 different etymologies from different languages. Borystenes for example has Greek, Iranian, Baltic, 5 Slavic and many other etymologies. Similarly other. We don’t know who and when named those rivers and how those names evolved and what they really mean and how correctly they represent original names. There is no R1b on the steppe in aDNA or modern distribution, so forget about Celts or Germans. I am still unconvinced of Indo-Aryans originating in the west, well, somewhere close to the Near East. Hudha, corresponding to a Babylonian "Air-god"
Ishtar (Venus star) as a huntress, appearing on kudurrus as a female on a throne. The Kassites lived immediately north of the Elamites, another linguistic isolate (possibly a distant child of Proto-Afro-Asiatic or a distant relative of it, like a sister language...which, if Elamitic did not already have a name, would technically be called, "Para-Afro-Asiatic"...that is based on Witzel's usage of Para-Munda...A language related to, but not ancestral to Munda). And from everything I have read...Indo-European languages borrowed words from the Semitic languages...I know of one case where the Indo-European terminology was adapted into the Semitic form and that was in the case of the Philistines...who were, apparently, Indo-European and transitioned to a Canaanitic Language that retained many Indo-European words in the form of a substrate language. Some of these Philistine substrate words made their way into one of the older forms of Hebrew (Biblical). For instance, the word, "Seranim"...apparently, meaning rulers or lords. Then there is the mystery of the Gutian Language...was it IE or an isolate??? To me, the evidence very clearly points to the Indo-Iranian languages coming from the east and spreading westward...But I am also prone to think that there may have been a migration of Indo-Iranian/ Aryan speakers that came down through the Caucasus from the Caspian steppes southward...but I have no evidence of this other than to say it is extremely plausible. I found this site that seems to agree with me...they say, "To the north of the Kassites, there lived a group of people called Hurrians who were probably the native inhabitants of the southern Caucasus. They spoke a language unrelated to all other languages around them, and they seem to have spread quickly around the landscape in the second millennium BCE. Their area of influence stretched westwards to the Van Lake area and made them neighbours of the Hatti and later the Hittite Kingdom. Around the 1400 BCE, a group of Hurrian people formed a kingdom called the Mitanni in the areas of modern Kurdistan and eastern Turkey. The Mitannis adopted the Assyrian cuneiform and have thus left us with a few written documents of their civilisation. From these documents and also from an important inscription detailing a Mitanni peace treaty with the Hittites, we know that at least the ruling class of the Mitanni kingdom were from an Indo-European and specifically Indo-Aryan background. A manual for training of horses uses many Indo-European names for horse accessories, and in the aforementioned peace treaty, we have the name of many Indo-Aryan deities included in the pantheon of Mitanni gods. This has for long puzzled the historians, since the distance between the Mitanni and the rest of the Indo-Aryans who at the time lived in Central Asia and Afghanistan is great. Conventional scholarship suggests a migration of Indo-Iranians from the plains of Central Asia to northeastern Iran and then south to the Indus Valley. If this view is accepted, the existence of a semi-isolated Indo-Aryan ruling class in western Iran seems highly confusing. A possible suggested answer is the migration of a branch of Indo-Iranians from the northern plains of the Caspian Sea down the Caucasus and into western Iran. This and other suggestions seem to be kept at the level of theory in the absence of empirical evidence in their support." What do you think of that, Dienekes? Where the author Valentin Stetsyuk, Lviv, Ukraine writes about the relationship of the Germans vs Iranians in the North Pontic Steppes (aka Ukraine)?! When the Turks left their territory, the migration of the Indo-Europeans followed. As the first, speakers of Hittite-Luwian moved in the direction of Anatolia and entered there around or after 2000 BC. Later the Celts, the Illyrians, the Italics advanced westward, and the Greeks migrated towards the Balkan Peninsula following the way of the Hittite-Luwians. The Indo-Aryans went to the southeast, but the Slavic, Baltic, Germanic, and Iranian tribes remained in Eastern Europe for a long time. Such presumption can be plausible as the Slavic, Baltic, Iranian, and Germanic languages share some mutual characteristic features. One of them in contrast to the other Indo-European languages is transforming the ancient Indo-European bh to b. These two sounds were fallen together in the Slavic, Baltic, Iranian languages but in Germanic b was evolved to p. The voiced aspirated stop bh either has kept or evolved to different sounds in the other Indo-European languages. I'm no linguist, so can't properly evaluate the evidence, but I will say that it would offer an alternative explanation to the "Dagestani" component, which would account for elevated levels in NW Europeans (British/Germans/Scandinavians) ?! I don’t want to claim that the Indo-Aryans lived in Europe, just a small sidemark. Herodotus mentions the Iranic Sigynian in Europe. But they were most likely within the Scythic/Cimmerian spectrum of Indo-Iranians. Less likely remaining fragments of Indo-Iranians from the balkans. Pconroy, I asked you for scientific peer reviewed papers, not internet crap. What Valentin Stetsyuk writes is total nonsense. I have never heard about Turks in Europe before Indo-European expansion. I have never heard about Anglo-Saxons in Central Europe etc. Germanic, Celtic, Iranian, Greek and other IE languages didn’t originate in Eastern Europe. Germanic languages evolved in Western Europe, so did Celtic, Iranian in Iran and Greek in Greece. They are all related to PIE, but they were not formed in one homeland. It is like with Romance languages. Romance languages come from Latin, but they didn’t originate in Rome, or even in Italy. It wasn’t like that Latin split into Romanian, Portuguese, French and Spanish languages in Italy and then Romanian tribes migrated from Italy to Romania, Portuguesa tribes migrated from Italy to Portugal etc. It is nonsense. I repeat, Scythian languages are not known. We cannot assign them precisely to any language family because we don’t know their grammar and lexicon. Did they have dual forms 500 B. C. like PIE and Slavic languages today or lost them like all Indo-Iranian languages before 600 B.C.? Did they have ‘o’ vowel like PIE and Slavic or only ‘a’ vowel like Indo-Iranian? How verbs were conjugated, like PIE and Slavic or did they follow modified Indo-Iranian paradigm? How nouns, pronouns, adjectives, and articles were inflected? We don’t know that, because no Scythian text has survived. If we knew that we would be able to say whether they were more similar to Slavic or to Indo-Iranian. It is believed that there existed Proto-Slavic-Indo-Iranian continuum some time ago, because Vedic Sanskrit and Avestan are similar to Slavic. But Vedic Sanskrit was formed in India, Avestan in Iran not in Europe. So all those languages between India and Iran and Eastern Europe could be either closer to Indo-Iranian or to Slavic. We don’t know that. Slavic languages are more archaic and conservative, closer to PIE, than Indo-Iranian languages and I believe that Scythian languages could be closer to Slavic because genetic studies of aDNA tell us that ancient Scythians were genetically closer to Slavs than to Iranians, and languages usually correlate with genes. ziemovit : "Scythian languages are not known"
What about Ossetian? and what about the Saka language of Xinjiang? What about all the recorded names of Scythian, Sarmatian and Alanic individuals? Dienekes : "for the Cimmerians there is zero evidence that they were Iranians"
Given their nomadic "way of life" (close to the Scythians; let's not forget this typical way of life appeared only a few centuries earlier in the central Asian steppes), and the name of some of their kings, it's generally supposed they at least had an Indo-iranian elite. AdygheChabadi : "Hittite ("centum") "azu-wa", Ugaritic "ssw"" - "I thought that the Anatolian IE languages were older than the Indo-Iranian branch and developed separately from Indo-Iranian as many of the innovations found in many ancient IE languages are lacking in the Anatolian languages." So what? That's the whole point. In the Kurgan theory, it generally is supposed that some Indo-iranians brought the concept of war chariot in west Asia and the blood horses to fit the requirements for this type of warfare (hence the Mitanni case of an Indo-iranian elite and the vocabulary about horse and chariot among a Hurrian-speaking population (all invaders)). The words would have been adopted by the populations concerned by the process (Ugarit and Hittites were neighbors of the Mitanni, BTW). As for Lycian "esbe" (I think it's attested toward 700 bc) I'm not even totally sure it is linked with Indo-iranian since by that time, IE "satem language-speaking" population that supposedly migrated from south-east Europe to Anatolia (Phrygians for instance. The Thracians were Satem, at least in classical time. Also think of the Moesia region of ancient south-east Balkans and of Mysia of north-western Anatolia that could possibly support this view). @ Ziemowit : "So all those languages between India and Iran and Eastern Europe could be either closer to Indo-Iranian or to Slavic. We don’t know that. " So how comes some Typically Indo-iranian words are found among Slavic languages? E.g. Russian bog (god) and Indo-iranian bhagas or Russian budit' (to awake, to wake up) from the same root than the Indo-aryan word Buddha (meaning "the awakened one")? Waggg, those “typically Indo-Iranian words” are in fact typically Slavic words. There are hundreds of similar, almost identical words. Those languages are very closely related. Learn Polish and Vedic Sanskrit and you will see. Polish is more archaic and conservative. Words are closer to PIE. For example ‘wheel’ in Polish is ‘kolo’ and ‘kulko’ in Vedic Sanscrit it is “cakra”, in Avestan Iranian it is “caktra”. So we can see here a lot of sound changes and modifications: ‘k’–>’c’, ‘l’–>’r’ . Assumed PIE roots are “*kuel” and „*keklo”. Waggg, please don’t quote Wikipedia, it is mostly outdated crap. Try to find some scientific peer reviewed papers. "Waggg, those “typically Indo-Iranian words” are in fact typically Slavic words"
I don't think so. These specific words (and a few others) are only shared by Slavic and Indo-iranian if I'm not mistaken, they are not found in other IE language families AFAIK. Thus they quite likely entered Slavic because of the Scythian or Sarmatian presence in their area of origin (Slavic and Indo-iranian are not exactly twin sisters despite what you seem to say). "Waggg, there is no relation between Scythians and Ossetians"
Not Specifically Scythians, but Alans, it seems so. "Scythians were not Iranians. We know it from genetics. Read here"
I can't go these pages, but that's really unimportant because I can't see how genes could show that Scythians weren't speaking some Iranic languages. Plus IIRC, the testing of ancient DNA from Scythians or Sarmatians' Kurgans (mtDNA-wise) fit what was found in the ancient DNA of the Andronovo horizon. "Waggg, please don’t quote Wikipedia, it is mostly outdated crap. Try to find some scientific peer reviewed papers." Since Wikipedia is using scientific peer-reviewed studies I can't see how your comment is of any relevance. A little OT, I agree that Slavic (and perhaps even more so Baltic) are more conservative in many ways. However, part of that is also that western IE languages have had their own shared contacts for the past 3,500 years or so. There is just no straightforward tree for modern IE languages, but the older forms are often still present. For example, you still have northern German kollern (the sound something heavy makes when it rolls or when it becomes "unround"), kullern (to roll), and of course German Kugel (sphere, ball). You can see how the other forms (to roll/rollen/Rolle; sphere, ball) have become more mainstream in western IE, but the other form persist. At any rate, whether Semitic <-> IE or Germanic/Slavic <-> Iranian, one has to be very careful about the actual direction and antiquity of loanwords. For example, I wouldn't be surprised if many shared agricultural words are loosely of pre-IE Anatolian origin and migrated from there into adjacent directions and territories, which independently evolved different language groups such as Semitic and IE. In such a scenario, a specific loanword is neither Semitic nor IE. Iranic is way more diverse than Slavic=>more ancient. Balto-Slavic is 5400 years old while Indo-Iranian is 6600 years old. 1"Pokorny describes (the pie root for six) uncertainly as *sueks,*seks,*kseks,*ksueks,*ueks or*uks.The Sanskrit form is xat but the Avestan is xsvas.The initial cluster xsv is unparalleled in Indo-European.This suggests a loan but from what Semitic form?Akkadian and Hebrew have forms based on s--s/t.The conventional explanation is that the Semitic root is *sds,but th,s was dropped in the southwest asian languages.Saul Levin uses Egyptian form sis or srsw to postulate that the Afroasiatic root was SeCS.He also insists on the importance of the linked numbers six and seven in mesopotamian and semitic culture.There were for instance, the seven visible planets, leading to the days of the week, the seven days of creation and resting after the sixth day, not to mention the sexagesimal system." 2"The word "Aryan" has an Afroasiatic origin.It is a loan from Semitic into Indo-Iranian.In Ugaritic the name "ary" was used as a gentilic (name of a people), but the word "ary" (companion) is clearly related to Egyptian "iri" with the same meaning.This relationship is only one of a number of LINGUISTIC INDICATIONS THAT THE INDO-IRANIAN WERE IN CLOSE CONTACT WITH SEMITIC SPEAKING PEOPLES OF MESOPOTAMIA AND SYRIA.the Indo-Europeanist Oswald Szemerenyi has argued plausibly that the reduction from PIE 5 vowel systems (a,e,i,o,u) to a 3 vowel system (a,i,u) in Indo-Iranian was the result of contact with speakers of Semitic.As Szemerenyi emphasizes, such a fundamental borrowing indicates very close contacts." "There is no doubt that bar/bur (grain) is widespread not only in semitic but throughout afro-asiatic"
"as for proto indo-hitttie *kou (bull,cow), Orel and Stolbova propose an Afro-Asiatic root *gar=calf, the possible related form gw can be placed in another Afroasiatic root *gaw also attested in Berber, East Chadic and Omotic." 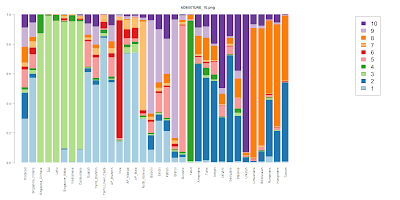 "Iranic is way more diverse than Slavic=>more ancient." Excluding late Semitic loan words, I have never seen any evidence for this, at all. All analyses I have read place Iranian as a very clear IE derivative, downstream of a number of evolutions. At any rate, the paper you cite is neither mainstream, nor does it support your assertion. The paper you cite is a nice early exercise in computational linguistics - but just that. It's a first attempt that however at that point pretty much doesn't get anything right, yet. - From the paper itself: "Cognates are words inferred to have a common historical origin because of systematic sound correspondences and clear similarities in form and meaning. Despite some initial enthusiasm, the method has been heavily criticized and is now largely discredited," and "substantial borrowing of lexical items between languages makes tree-based methods inappropriate." I agree with that. - Sound/word change timing is highly dependent on usage frequency. If you ignore that, you can easily get an order of magnitude or more wrong time estimates. - Modern and attested ancient IE languages plainly do not follow a clear-cut tree pattern. Local Sprachbunde are as important, sometimes more important. The Greek/Balkan complex is one well-known example. Another is Germanic languages, which pretty much at any given time have incorporated words from all over their neighbors - that is, Iranian, Slavic, Greek, Latin - and later Spanish, then yet again Slavic, French, and English. Anytime you look, you can see words that went from e.g. Slavic --> Germanic, then later back to Slavic, and sometimes back a third time. And that is mostly just the past 1,500 years. Imagine what happened before! In other words, a much better description of linguistics is that of regions in which language persistence and/or change happens. In that notion, labeled languages are just fleeting snapshots of somewhat congruent projections. It's akin the discussion of catastrophic events versus slow changes in geology or genetics - except here, when there are suddenly 200,000 people with the same language, it may be the precursor of a catastrophic change; when there are few people speaking the same dialect, things change slowly. Proto-Greek, which may be about 4,500 to 3,500 years old, in this figure has been a 7,000 year-old isolate. But why? And where? And how? And why is it then still so similar to proto-Germanic? - The timing is totally off with respect to well-documented sequences. For example, Germanic language divergence happened around the Bronze age - not 250 AD (when German - not Germanic dialects had started to consolidate). It's not Persian but proto Iranic is 4500 years old. This is probably the most complex and controversial group among the Indo-European languages. Having been studied only as late as the 19-20th century, it remains largely unknown to many Indo-Europeanists in the west. For years, researches have tacitly assumed that there should be nothing in Iranian which can't be found in Avestan ignoring the many bizarre peculiarities of this family. It was, for instance, poorly represented in Dyen's lexicostatistical research. The group's textbook classification (Northeast to Southeast Iranian) is completely unacceptable and is hardly supported by any linguistic arguments at all. In fact, a closer look reveals a complicated branch with many different sprouts. The present lexicostatistical study, for instance, shows that the actual difference between Russian and Lithuanian might, in fact, be less than between Wakhi and Shughni, both of which are believed to be "Pamir", or sometimes even called "Pamir dialects". The group average lexicostatistical depth of about 60% indicates that the East Iranian languages have been hiding around the Pamir and Hindu-Kush mountains probably since about 1000-1500 BC, branching off into several subgroups shortly after the period of separation of the whole Indo-Iranian supergroup. 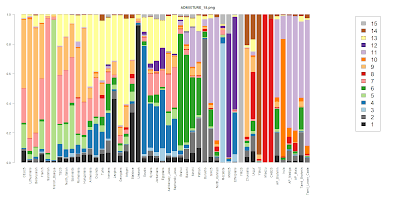 As a result, they can be regareded as complex and probably even a rather independent taxon of Indo-Iranian languages. The Pamir languages may form an internal genetic unity with three following subbranches: (1) Yidgha-Munji; (2) Ishkashimi-Zebaki-Sanglechi; (3) Shughni-Rushan-Sarikoli-Yazgulami. The first two are rather closely related (1)/(2) ~80%, while the third is a little more differentiated (1)/(2); (2)/(3) ~ 70% (on average) with Yazgulami being particularly different. There might also be some speculations on relating ancient Bactrian (the language of the Kushan Kingdom) to Yidga-Munji, but the precise lexicostatical study of Bactrian is absent due to lack of lexical material." "All analyses I have read place Iranian as a very clear IE derivative, downstream of a number of evolutions." I never wrote the contrary nor wrote anything about Iranian not being an IE derivative. Ashraf : "proto Iranic is 4500 years old"
Given that old Avestan (used as a language of the Zoroastrian scriptures; it's generally classified as an ancient East Iranian language (actually it's more to signify "non-western"), even if it's controversial) is rather close to Sanskrit (For instance, you can understand most of the Gathic (Old Avestan) words just by knowing Sanskrit), I'm not convinced of this.